If the photo of Viggo and Michael were edible, I'd eat it in one gulp! Just posting these two images from the London premiere of A Dangerous Method occuring, *right now*! Oh Jesus, those pants are CRIMINAL. Hee hee. But criminal good or criminal bad? They do look quite tight, ahem. We should probably be grateful he isn't wearing an enormous coat, it's positively Siberian in London at the moment. Keira must be freezing her arse off in that slit-to-the-waist and backless number. I'm just pleased the beard is back. I love a bit of ginger scruff, me. I agree Keira must be freezing but her dress is so beautiful! I love how Michael was dancing with everyone (male and female) last night! 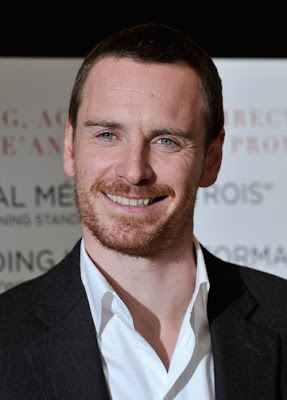 Awesome Fassy is perfect! He so playful. I especially like the one with the piggyback ride. Man, I wanna dance with him too! Awesome Fassy is perfect! He's so playful!! Three words: piano players' fingers... mmm. Honestly, though, he plays the piano as well as the accordian? Is there no end to the man's talents? Why is Keira Knightley holding hands with a 12 year old girl?